We are united in our desire to do what's right, this makes us powerful, and this eliminates our fear. Something was born of the revolution, something that makes the dark times brighter, something that makes us better people, something that raises us when we’re down. That something is hope. It is hope that I see around me that lifts people despite the harrowing news, despite the confusion. It seems a little childish of me to hang on to something like hope. The word had lost its meaning in the recent dark ages that passed. It was a something to mock, something to ridicule, something out of a cheesy movie. It was a word much like 'love' defiled and stripped of meaning. In Egypt, one could have asked if you believed in 'hope' in the same manner as one would ask if you believed in 'love'. I am aware now as I write this of how silly it may sound to those who have not experienced a revolution within themselves, but I make the case for hope having experienced it ever so closely. It is a feeling of value, that I matter, that my actions mean something and help someone. It is a feeling that despite everything I can be helped by someone. It is the belief that good can triumph if you fight hard enough. It is all of these childish fairy tales that I believed before. When hope was born, I became like a child once again, with the same faith I had in great notions without any of the doubt. But this hope is better than that of a child's, for it is one that understands reality and is not deterred by it. It is a hope that is not moved by danger or the dark reality. It is a world is seen from a different vantage point, even though it hasn't changed at all. This sort of hope is more sophisticated because it retains the optimism of a hopeful child and the wisdom of an old cynic. Police treason left us with some of the darkest experiences the country had ever witnessed. The aim was to drive us back to despair, but it didn't work, it was too late, hope was born. With much pain this hope was born, with much sacrifice, with much death. These trying times would have discouraged Egyptians before their new found hope, but they bore it out, they welcomed the darkness served with vengeance from our ex enslavers. It was a price they accepted to pay for what's to come, the hope that was born. There's something different about Egyptians. Those losing money may be upset but not troubled, those facing danger are worried but not feeling unsafe. The youth finally feel they're the future of the country. Some of have done great things for other countries but were deprived of that chance in Egypt. In the past, it didn't matter what we did for the country, we knew that somewhere along the line it would hit a dead end at some corrupt official’s desk. We expected stupidity from our government and we got it. People started to care because there was hope that their action or sacrifice will not be in vain. Hope was injected suddenly into the veins of Egyptian. It was as if someone who had died was resuscitated, opened his eyes, took a deep breath and jumped up as if he hadn't died at all. I write this now even as things have not turned out as we Egyptians hoped for. We’re still dealing with the old regime with new faces. Very little has changed but the little that has is very important. The people have changed, and they now have a new found weapon called hope. I write this now even though I feel down continuously, worn down by all our attempts foiled by the corrupt who roam the country unquestioned. I see my friends feeling down too. The evil of those who govern Egypt is deeply rooted. At times like these I remember that people can make a difference, and that as long as this hope is alive, we have something to lift us up in the face of events to come. At times like these I remind myself that people can cause things to change. I remind myself that we could foil the plans of a few corrupt men even though they have the guns and the power to command an arsenal of mercenaries. They may have the power to command, but we have the power to love one another. I remind myself of how many more people are choosing to do what’s right, how many more people are willing to die for what’s right. I remind myself that what we do today makes a difference, that we have a chance to act based on our principles without necessarily expecting to fail. I remind myself of the valor and the sacrifice of young men and women who died. I remind myself of my fellow Egyptians who left the rest of the world in awe. All I have to do is visit Tahrir Republic or remind myself of it. I remind myself of truth. I remind myself of freedom. I remind myself of justice. But most of all I remind myself of hope, which makes all these things possible. A guide to understanding the Egyptian Military’s decisions in the past and over the next few weeks. Is the military with Mubarak? They’re not, in any case, the Egyptians will never take Mubarak back no matter what, something new has to be provided. Is the military with the people? They’re not. All evidence so far point to the idea that the military is playing a different game. The military wants to remain in power long enough to be able to determine Egypt’s fate. They want to determine the next parliament and the next president. The political scene must not be decided through democracy; there must be approval by the military. Through sustaining a sense of insecurity and by keeping protests weak. Very little efforts will be done to avoid incidents that cause threat to Egyptians such as priest killings, house burnings and other small incidents. They will sustain a sense of instability by not eliminating the threats that are identifiable by people. They will also hold the reigns of all political powers that shape the country and will not allow free thinkers in the loop of this transitional period. The military insists on maintaining control of everything. They know what people want but they’re not doing it. They are doing the bare necessities. The actions taken by the army are enough to split people’s loyalties and cause them to put some form of trust in the military; enough to clear Tahrir square, but not enough to bring down the regime. By keeping people hopeful of changes in the future, they are hoping to quell the revolution. Note that the military has systematically attacked monasteries and aims to sustain an air of tension. It has not touched the ministry of interior and it has not brought to justice its security arm. The police remain corrupt. The military hopes to restore enough trust in the police and use them when the time comes. None of the police have been held accountable to date, and there is pressure applied on the martyrs’ families to drop charges. Corrupt businessmen that have worked in the shadows are still on the loose, and they still maintain power. Some influential names are Safwat El Sherif and Fathy Serour. Mubarak has already been scapegoated. Political control now is through the military and its ally Ahmed Shafik. Note also that when doubts escalated, the military compensated by appearing on television and insisting that they had little time and only discussed things already promised. When they were asked about Ahmed Shafik, they evaded the question and pointed out that it was their decision not the people’s. Speaking of which, why hasn’t Shafik been sacked? The military must ensure that it has the right people in the right places. The right people are those who are willing to sell their soul to anyone for the right price. This includes several ministers and persons in key positions and businessmen. One of these people is Ahmed Shafik who the military insists on keeping despite opposition. They have not made it clear why, which means that they are not with the people. Shafik has been part of the system and while he may not be corrupt to the bone, he will do whatever political maneuvers to survive. He is a survivor first and foremost and has no qualms with the old regime polices. The military is funded by the US. The US has not reduced any of the aid provided to Egypt. The decision to oust Mubarak was strongly supported by the US. In exchange, the military is to retain control on the political front, not aggravating the people enough for another uprising but at the same time maintaining a level of threat that justifies their control until the parliament and the elections. The parliament is important for the military to assert complete control. That is why the military insists on having the parliamentary elections before presidential elections. Inconsistency of their position. Why is the military allowing the police to operate in a manner similar to that before January 25? Why is it tearing down monastery walls? Why are government mouthpieces still spreading their venomous lies? Why did the military not explain the attacks on the monasteries? Why did the military reclaim land just outside monasteries instead of much more land suitable for agriculture taken over by others? The military has authority to change laws and yet uses the excuse of laws that shouldn’t exist to justify the ineffectiveness of its actions. Furthermore, military propaganda is a lot like state TV, they never admit to doing anything incorrectly and the language of flattery to the Egyptian people is in my opinion patronizing. This is not a question, but an expected attitude. How can we accept that all the government has conspired against us? I share the same sentiments and have struggled to accept these conclusions. I do not want to believe that our last hope in establishments might let us down. Much to my own dismay all logic and reasoning point to this direction. The truth is that we cannot trust anyone but ourselves. *These answers were written before any of the events that took place on Friday 25 February. These FAQs were written in attempt to provide a key to understanding the army’s motivations and the events to come. Much of this is emotional; unlike many, my heart is not all filled with celebration. I’m filled with fear, with joy, and with remorse. It’s hard to believe that the time in Tahrir Republic is coming close to an end. We found something in Tahrir that we’ve missed for so long, indeed it may be something many haven’t ever found. 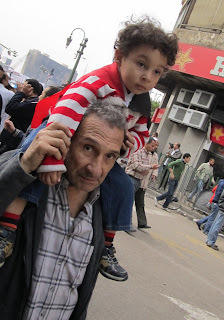 In Tahrir there was unadulterated love of a nation by people who have been crushed by it. So many voices silenced in the past, so many talents wasted, so many lives not spent well. 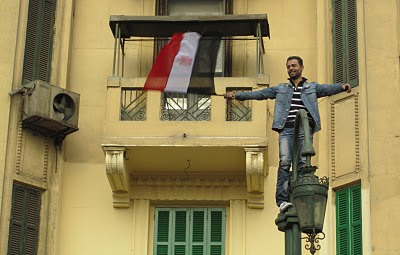 In Tahrir we found each other, we found the true meaning of nationalism. I always hated that sentiment though, that pride of belonging to a nation. 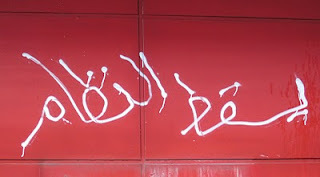 The whole world was my nation, but in Tahrir, I found out what it really means. It means your brothers and sisters and your whole extended family living in the same place, sharing the same emotions and sharing the same thoughts. 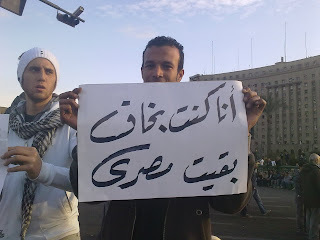 In Tahrir, there was hope, and there was a common goal and a common pain. Tahrir did not just teach the world a political lesson, it taught the people there much more than they knew before coming into the square, Liberation square, where people went to find their freedom, but found it in one another. Tahrir transformed the people there. Many have spoken about the community there, the collaboration and the kindness strangers have shown one another. It was a journey that we all shared, and we found there the best in each other and in ourselves. I learned the meaning of the words ‘Tahya Masr’ which some people translate as ‘long live Egypt’. The literal translation though is ‘Egypt lives’. I learned what it was for the dead to rise; for Egypt to live after years of being buried underneath a rubble of hatred, extremism and poverty. Tears fill my heart as I think about everyone leaving and going back to their daily business. Will they remember the strangers who became their brothers? Will they remember what it feels like to serve one another with joy? Will people ever take this hard earned chance of freedom for granted? Even now, I remember the faces of those who died in this battle. I do not want them to be forgotten. They were ordinary people trying to fight for their own dreams, taking on a beastly Goliath. They ended up fighting for our hopes and our dreams. They ended up running into the eye of the storm in the hopes of stopping the destruction it was wreaking. I wish those who reap the fruits of this struggle will always remember how brave it was for those people to start caring. They could have selfishly lived on in the comfort of their lives, but they selflessly walked out of their homes to face a danger that Egyptians have feared for 30 years. I wish that people could know and remember how much courage that took. I heard that Egyptians were once a great people, that they were once full of love for one another, full of ideas and adventure. I did not see those people much as I traversed the streets of Egypt. I saw only glimpses, like shooting stars, and they were not enough for me to have faith in my people. I wondered to myself where did the real Egyptians go? I searched the broken down streets of Cairo, and I was surrounded by darkness. I searched the other cities and they were crowded and poor. I searched for Egyptians that could live up to their history, I searched for Egyptians that could be countrymen. For the longest time I could not find them, but I finally found them in Tahrir. One of the most phenomenal aspects of the revolution in Egypt is how young people went out in masses despite their usual passiveness and the pervasive culture of fear security bodies have built. 30 years of oppression provide ample reason to go out and protest whether for price increases, poor wages, taxes, pensions or the corruption within the entire People’s Assembly. Many of the protests before January 25 were related to professional grievances. There were protests for doctors’ wages, railway workers, government employees and factory workers. All of these in my opinion were just catalysts. The real reason people went out and protested on January 25, 2011 was because of Khaled Said. In June 2010, Khaled Said, a young man of age 27, was murdered in Alexandria at the hands of two police goons in plain sight. He died for seemingly no reason but refusing to show his identification to the plain clothed policemen who did not want to present him with their ID. They violently dragged him out of a cyber café, took him inside a building next door and beat him till he died. When charges were brought against the police, the forensic report was falsified and the Ministry of Interior started a smear campaign against the young man full of lies in order to cover up for the policemen. This incident of brutality infuriated most of the young people of Khaled’s age and class. It had been a long standing unspoken rule that people from good families were never mistreated by the police. This incident, the blatant smear campaign and the protection of the murderers struck a chord with young middle-class Egyptians. In retaliation, they staged demonstrations that took place opposite the Ministry of Interior protesting the injustice that had befallen Khaled. This was one of the few mass protests where ordinary citizens other than activists, journalists and certain professionals decided to partake including the disgruntled youth. The Ministry of Interior confronted the protests against police violence with police violence. Brutality terrorized protesters and many were arrested through the use of violent thugs. The young men and women, desperately trying to get their message across devised alternate forms of protests that wouldn’t anger authorities. They decided to protest in creative ways, such as asking people in Cairo and Alexandria to wear black, stand on the bank of the Nile or the Mediterranean, backs to the street reading whatever holy book they believe in. The authorities were still angered at this form of silent protest and cracked down on the protesters in various ways. It felt that authorities were not angered by the manner of protest, but by the concept of citizens expressing themselves collectively in any way. The feeling of oppression was driven to new limits with a clear message from security bodies: anyone can be picked on; anyone can be beaten to death. Not only do you have to accept it, but you have no right to object. Till today the authorities are wary of some sort of conspiracy theory unaware of how true the slogan was. The young men and women felt as though they were Khaled Said, it wasn’t a shallow slogan like those the government invents. They felt his mother’s pain and they felt his injustice as he asked he pleaded with his murders to stop their brutality. Despite all efforts, Khaled Said was not forgotten. He was the epitome of everything that was wrong with this country. Everything was building up in the background: poverty, ignorance, corruption, dictatorship and misrepresentation, but Khaled Said hit very close to home. When the Saints’ Church in Alexandria was bombed right after the biggest falsification of the People’s Assembly, people were further charged. When Tunisia proved that dictators can go and that injustice can be fought, the implosive energy exploded. Joined by others with various grievances, those young men and women took to the streets starting January 25 charged with a load of injustice. The young men and women fighting for their freedoms went out fighting for one another. They went out fighting so that there wouldn’t be another Khaled Said. They did not want police brutality to continue unquestioned; they did not want to live in a sea of injustice. They wanted the perpetrators held accountable. They wanted to be safe and they wanted their friends safe. They wanted a future where parents would not wonder if their child has been beaten to death by the so-called upholders of the law. They wanted a chance to express their anger, and tell the world not to believe the lies of the police and the regime. They wanted life; they wanted justice. I had thought the country would take numerous years to change into that which we hoped for. All it takes is a visit to Tahrir Square (which I now call Tahrir Republic) to see that it took only four days to change people. It is a revolution of the people, by the people. Like my fellow Egyptians, I too am shocked. Yet for the first time I look upon my country with pride. Many have died for us to have that piece of land in Tahrir that gives us hope for the future. Tahrir Republic is all that is good about Egyptians. I cried today. Like many others who watched Wael Ghonim's interview, I cried today. It was a moment that I felt so well. They were tears for a country that could have been. It was not the first time I shed those tears. I often cried for my country when moved by the goodness of its people; we don’t deserve this prison, we don’t deserve this injustice. I did not cry for Wael Ghonim but for the same reasons he did. When I saw those young beautiful faces of those who died for the revolution I was moved to tears. The reason I cried is because of their smiling faces. They weren’t soldiers, set on spreading their ideologies. They weren’t serious about fighting for some political cause. They were smiling because they loved life. Some seemed to have had a comfortable life. They looked like many I knew who ordinarily would have brushed off the prospect of making our country a better place and sat at a café. They all looked like they would have been happier driving off to a coastal city than walk into danger, into the hands of the tyrants that were sworn to protect us. They all could have stayed home that dreadful but glorious day. But on 25 January, they decided they must speak up. They would leave the luxury of their comfortable lives and fight for their dignity and ours. They would go to the streets and voice out their woes despite their fear. They would overcome violence with peace. Those ordinary young men and women of this country chose to care; they chose to fight for something great. They chose to fight for our children, for our future. Those faces on screen, so full of life, are dead for no reason but greed and evil. I look into their faces and I feel like I’ve always known them. They are my friends before I ever got to know them, and I will miss them although I never spent time with them. More than that, I love them all because they loved us all without having met us. There is a recurring pattern regarding the protests. On the day of the protests Jan 25, State Television remarked that the protests started well but turned violent in the middle of the day. This was done to justify police violence. On Jan 28, reports of the protest of Jan 25 changed completely, and the whole day was turned miraculously into a flawless, peaceful march, but that the real perpetrators infiltrated the protests on Jan 28. Some of the protesters were accused of setting police stations on fire. In the following weeks, the same thing happened, again and again. Previous protests were commendable but the most recent were or maneuvered by a foreign agenda. Do you see a pattern? Today, Safwat El Sherif and Gamal Mubarak have been removed and Hussam Badrawy, a man of more moderate opinions was put in charge of the NDP. Those who have asked for an end to the revolution have celebrated its triumphs. Every day they ask for protests to end, and are surprised by the results of its continuation. On Friday Feb 4 there was propaganda that almost 70 percent of the protesters were from the Muslim Brotherhood. Irrespective of sources that tell me otherwise, how does one reconcile the mixed messages? There were around one million people in Tahrir, this means 700 thousand of them were Muslim Brotherhood. If they had that many people in Tahrir, they would have been obvious for starters. If the Muslim Brotherhood had these numbers, why weren’t they there on Friday? They wouldn’t have waited all these years to start demonstrations. It’s highly improbable. Also if Muslim Brotherhood were leading this movement, why would they stick so much to the peaceful demonstration philosophy? If 70 percent were the brotherhood, that leaves 30 percent. Since almost everyone has been accused of having a hidden agenda, we can estimate a total of 25 percent of Syrians, Iranians, Israelis, Tunisians and Americans, which leaves 5 percent that can only be Egyptians unhappy with our dictatorship. Does that even make sense? The game is to convince people that protesters are to blame. But are they now? Let’s consider the facts. The reason work did not resume after protests is because the internet was out and because the Ministry of Interior let prisoners out. So why are protesters being blamed? It’s because the government said so, and nothing else. Why is there a curfew? Because the government has organized militia to terrorize Egyptian people. If you come to think of it, protesters are to blame because they stood against tyranny and terror, and for that the whole of Egypt is punished using tyranny and terror. When you ask protesters to go home, you are asking for the punishment by the government to stop. You are succumbing to the tyranny we all resent. People are risking their lives for our collective rights, and they’re being backstabbed by those who fear oppression and thus will end up being oppressed. The argument that the economy is collapsing is meaningless. It is also a form of collective punishment. The regime is hurting our economy to scare us. Why do you support the regime in the terrorist activity of destroying our economy? Don’t you know that if corruption is removed, we’ll rebuild our country in very little time? Don’t you know that one corrupt official like Ahmed Ezz can balance out any deficit even if they punish us like this for another month? Before talking of the economy, remember again how it is being robbed. Our losses due to theft and corruption are more than those due to the suspension of trade. We will make it up when we become a true democracy. There will be investments to rebuild and this time, they will flow to the economy rather than some Swiss bank or mansions in Paris, New York or Frankfurt. Mubarak has 40 -70 billion dollars of our country’s wealth. To put that into perspective, our total deficit is 32 billion dollars. Don’t worry about our economy, if some people can amass that much wealth, then the country will be fine when they leave. To those saying ‘give the government a chance’, I agree, but what’s stopping them? If they are true to their promises, the country will change irrespective of the protesters. The protesters are there to ensure that the decisions taken align with the promises. If the protesters had left when you first asked them to, Safwat El Sherif would have still been in power, Ezz and Adly on the loose, and a million other promises not unfulfilled. You really don’t know what you’re talking about asking people to leave and reaping their victories. You’re entitled to have an opinion, but please don’t discourage those in Tahrir fighting for your rights. It’s enough as it is that you’re not doing any of the fighting. If the regime is not changed, you will have a powerful, more oppressive police state. This is a regime that shuts down phones and the internet. This is a regime that sends in camels and horses to disperse crowds. This is a regime that runs people over with police trucks. This is a regime that promises freedoms and safe passage to all protesters in Tahrir and arrests them as its Prime Minister makes these statements. Do you think it is in any way serious about reforms? These people have died and been injured and you’re upset because you weren’t able to go to the movies or make an extra hundred pounds? Freedom comes at a cost and you’re not paying any of it. If you want to be enslaved by a tyrant, it’s your choice, but don’t force others around you to become as cowardly as you are. Two concerns have been planted by the regime in an attempt to divide Egyptians over their support of the protests which started on 25 January. The first and foremost is whether the Muslim Brotherhood will take over, the second is whether there is a conspiracy within the government orchestrated by some unknown entity within the ministry of interior and executed by rogue agents and thugs. I’ll answer the latter even though in theory it should not matter because all responsibility lies on Mubarak. In case you’re extremely confused and things seem conflicting, the answer to the question is a definite ‘No’. There is no conspiracy within the government, but there is a conspiracy taking place against the Egyptian people trying to win back their rights. Let me explain why there appears to be a conspiracy and why there isn’t one. The idea that what happened on Friday was a conspiracy is appealing in order to avoid having to think that this sinister plot is one devised by our rulers. To spread this idea is extremely clever, but here’s why it’s not true. How can we believe that a brutal police state does not have control over its most important tool? Is it conceivable that after 30 years, the police would defy the regime it has served so devotedly? Where is the traitor? If there were a culprit, the government would have offered them as a scapegoat at least to appease public opinion especially since these events only managed to infuriate the people and the protesters. Instead, like a guilty party, the government points fingers randomly at no one in specific and makes very general accusations to everyone but itself. The fact that businessmen were not allowed to leave, and their accounts frozen, is a publicity stunt and none of them will be prosecuted. The idea is to give the impression that an investigation is being launched without actually conducting one. The same is true for all the arrests claimed, where the charges are never made public. Notice how both Ahmed Shafik and Omar Suliman claim that all guilty parties will be brought to trial with no indication as to who the guilty parties are. In the end, they will most likely pin everything on the Muslim Brotherhood after investigations. When Vice President Omar Suliman was asked if the police had done any wrong, he denied that they had. He said they did a wonderful job. But the real problem is that police used excessive violence during the protests and had been given a signal to retreat simultaneously from all positions at the same time in various cities. If he were not aware, he would have been quick to point fingers at least somewhere within the Ministry of Interior. The question you must ask yourself is, what would Omar Suliman do differently if the regime was in fact the culprit? My answer is nothing, his statements reeked of guilt. On Wednesday, thugs hiding within pro Mubarak protests attacked the pro democracy protesters. Not only did they use knives and Molotov cocktails, they also sent in horses and camels and used live ammunition at the break of dawn. If you notice that on this particular day, Ahmed Shafik did not appear on television nor did he call shows to issue statements. This comes in stark contrast to the previous day where he appeared on several programs and the day after where he called many. This absence of comment is an implication of knowledge, firstly because I’m sure the prime minister watches Al Jazeera and secondly because camels and horses in Tahrir square are hard to miss if you’re following the situation closely. The fact that live fire from an automatic weapon was fired just before dawn waking up residents of Zamalek is just an overkill. Al Dostour writes that Ahmed Shafik considered handing in his resignation due to his disapproval of these tactics. There is a new Minister of Interior now, and yet the police seem to be absent. All we have left are thugs that are systematically cracking down on international journalists and kidnapping activists and bloggers. One of the prominent media personnel, Emad Eldin Adeeb, is spreading the idea that there’s a conspiracy against Mubarak. Mr. Adeeb analyses everything correctly, about how people feel, the Muslim Brotherhood, the youth, but fails to identify with equal accuracy who the traitor is within the system. He has accusations but the aim is to shift the focus on everyone other than Mubarak and his regime. Also note that when he says there is foreign involvement, he uses it very loosely without identifying what the foreign elements are, he only claims they exist. If he were really trying to warn youth about a certain danger, he would identify those elements clearly, but the ambiguity of such accusations make them baseless. There are a few other questions. Why was the internet restored on the same day these violent attacks took place? The plan was to drive the protesters out of Tahrir square and spread news of pro Mubarak protests taking over. However camels and horses did not manage to implement the plan, and neither did Molotov cocktails nor live ammunition. The resilience of the protesters of Tahrir in the face of death was not something the regime counted on. Why don’t these protesters go home so that normal life resumes? The protesters never caused banks to close. It was the absence of police and their organized militia and the shutting down of internet and a decision from the top. The protesters are in no way linked to the siege on the major cities in Egypt. This is a collective punishment for asking for our rights. I can assure those hesitant about what’s happening that there is no internal strife in the government, they are only trying to use psychological warfare through unfounded theories, conflicting actions and media games. We all know who knows how to play these media games, and it’s obvious they don’t want Mubarak to leave. I’m asked often how I feel about what’s going on in my country. I’m asked for news while I follow the news on Al Jazeera, twitter, friends from the scene or what have you. I haven’t found the right words to describe how I feel today, perhaps because it is a mixture of emotion and grief. It’s sad to belong to a group of people betrayed by everyone around them. An army chooses to stand idle as civilians it is sworn to protect are killed by a police that were sworn to protect. The words cannot express my rage at this injustice that we face, betrayed everywhere from all sides, except the people of other nations. Together we stand in solitude against the oppression of our governments and their quest for power. What can I say, when words have no place. I am shocked at the amount of evil we’re faced with. At dark times like these how can one believe that the power of goodness can overcome these dark forces. The people protesting are not angels, they are human beings who might have taken bribes, or broken the law. But they are showing goodness beyond the capacity of human beings. Those people brought up in the most dire conditions, where you take what you need by force have embraced an idea based on faith not logic, that these protests will be peaceful. They did not take up arms, or weapons or make Molotov cocktails to prepare for their protests. They went unarmed in open space against the oppressive of governments with the sole faith that goodness shall prevail, that they must adhere to peaceful protests and not throw the first stone. How did these people, lacking education, lacking the experience of right prevailing, overcome their past experiences and decide to protest peacefully for a change such as this. The Egyptian people would make any nation proud. They have stood up for their rights in the most admirable way imaginable. The atrocities of this regime are the worst and anything change will bring will be better. A wounded beast hanging on to dear life, taking down everything around, destructive and sinister. For the regime, they are slaves, to be herded, intimidated and killed. The country is in ruins as we speak, and those who rule it are determined to destroy it before they leave. They would rather burn it all than give any of its citizens a piece of it. Tonight is a scary night despite so many things that relay a sense of security. The scene in Tahrir completely festive, friends I’ve met, people I’ve talked to. The army is protecting people against the tyranny of the police. Tomorrow the million march begins and what scares me is that I have too many questions about what just happened this past month. A church bombing; a policeman killing copts, police brutality. All of these took place. Surprisingly enough the army moved in and nobody was hurt. The army protected Egyptians. For a while, no one knew whose side the army was on. Then, the army made it clear that it means the people no harm. But who controls the army, isn’t it Hosny Mubarak? If he was behind police violence, why did he not order the army to shoot at protesters? Did he give the order and did the army refuse? So many questions and mixed messages that cannot be interpreted easily. Passion is blind and does not ask for explanations and that’s why I suppress my passion and search for answers. If Mubarak controlled the police, why did he order them out of every inch of the country at the same time? But at the same time, why did the army take steps to fill that void? Is Mubarak sinister? I don’t have the answer to that question, because I’m not looking for my answer through passion. Is Mubarak capable of such grand treason to the people of Egypt? Why then has he kept Egypt out of wars and bloodshed. He may sell parts of the country, he may make friends with our enemies, but is he a man who has no regard for human life? He may not care for people’s financial well being, but is he mad enough to tear down everything he has built? I’ve liked Mubarak on a personal level. He can be funny sometimes and is largely considered a war hero. Whenever anyone he knows gets sick, he calls, for he knows that health is such an important thing. In my opinion he does so out of a sense of respect for that matter. He is a tyrant however and cannot be trusted. I loathe the way he runs the country, and I believe that whether it is intentional or out of ignorance, the result is that he must leave sooner or later. Unlike the rest of the revolution, I opt for later. The truth is that Arabs have seldom had an ex –president, and that would be nice to have. He hasn’t massacred people like a Stalin, he hasn’t sent our troops to die for another person’s war like Nasser. In fact, he hasn’t done anything but take away our dignity. He should stay in Egypt and be tried for the dereliction of his duties. I’ve said this before but no one really listened, we’ve already won, but we just don’t realize it. We have made our voices heard, worn down the seemingly invincible police, brought in the army and for the first time applied enough pressure for immediate change. A voice of reason asks me not to make this overthrow an illegitimate one. I want to wait so as to do it right. I fear for the plans of these power hungry men to subdue us again, but I feel it is our duty to do things right and not be like them. We can’t be unlawful just because they are. We’re becoming the new tyrants. Each of us, from the oppression and injustice we faced exploded into self righteousness and from there on tyranny. The messages are mixed. Omar Suliman, the vice president has promised to talk things out with opposition, and at the same time he promised to uphold the rule of law. That sounds promising but is it true? Many things make me doubt the regime’s intentions. Why has the internet been blocked? Will the phones be blocked? Why? All I know is that we have power, and we need to negotiate our terms with someone. It took them so long to do this, and while the decision may be delayed due to unforeseen reasons, it seems that they don’t want to give us what we want. Today is a night to be remembered. Are we being played by various forces? Why did burglars try to break into Maspero (the television building), why were there documents that asked protesters to occupy Maspero. There is a grand conspiracy out there somewhere, and it may be that the young people were being played. I feel there are so many unanswered questions and my theories which I did not share may all be false. At times like these, despite my innumerable thoughts and hypotheses, I will do nothing but pray. For with such unknown odds, one must ask the powers that be to allow the best to happen. I pray for no bloodshed, too much has been spilt already. I pray for no chaos, too much has taken place already. I pray for justice, too much injustice has been served to us already. A mob has no brain, I pray they stumble upon one tomorrow.